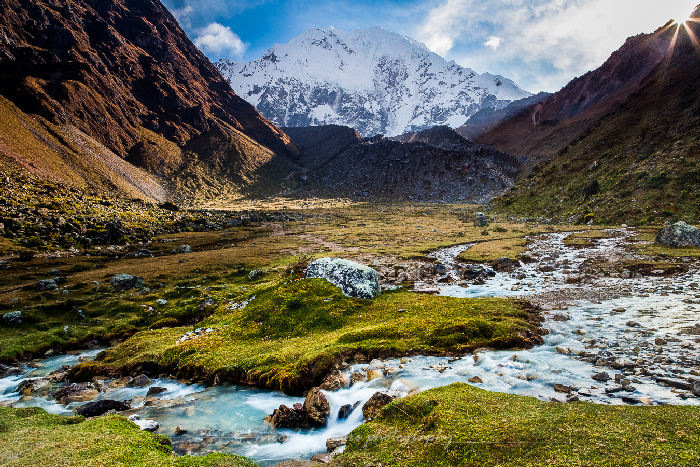 The trek to Salkantay trek is designed as an alternative route to the traditional Inca Trail to Machu Picchu, it is a cutting edge experience for travelers looking for walking, hiking and adventure in their travels. 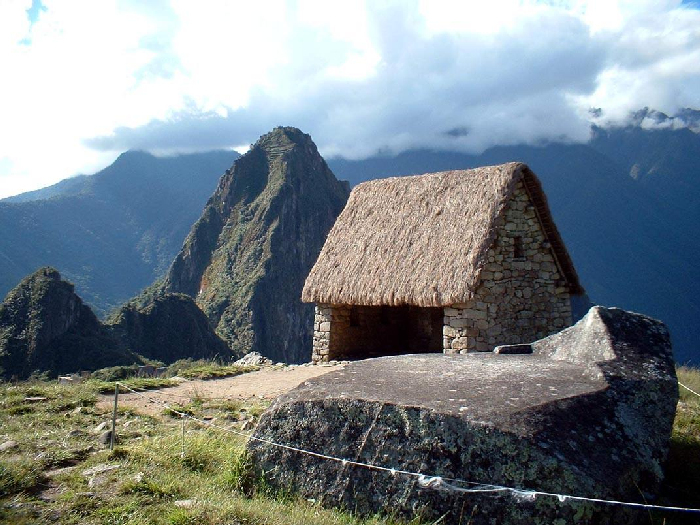 Taking the tour to Machu Picchu Salkantay trek Wayllabamba a little more privacy and authenticity with nature. With most spectacular views to take pictures. Hotel shuttle to the town of Mollepata (3000m), a meeting with the team tour. We pass the village of Cruz Pata (3400m), arriving to observe a magnificent valley, mountains and the most important as the Humantay Nevados (5217m) and Salkantay (6264m). 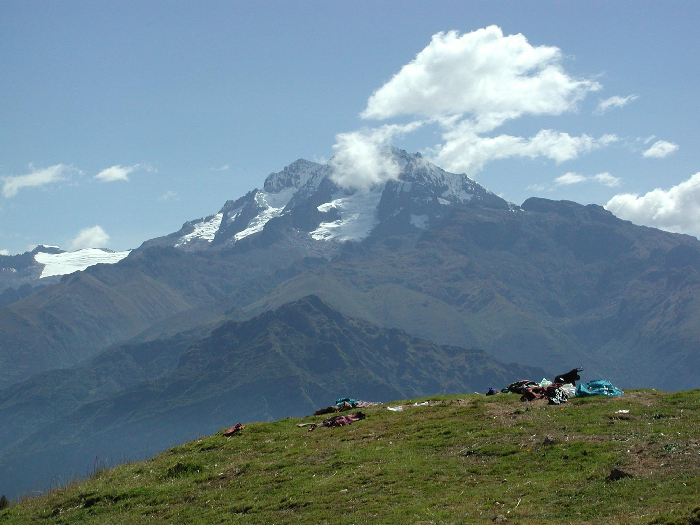 Our camp is Salkantay pampa (3900m). Transport time 4 hours. Hiking time: 6 hours. moderate and cold during the night warm weather. It includes breakfast, lunch and dinner. The morning is conducive to start the climb to the highest peak of this Inca trail called step Salkantay (5200m), where we have the magnificent presence of the mountain Salkantay and others who form a perfect setting in harmony with nature. These mountains like Humantay (5217m), Tucarhuay (5450m) and Soray (5428m); They leave us breathless and certainly hold great mysterious secrets. After the summit we descent to the next camp called Sisay pampa (3700m). Hiking time: 7 hours. cold weather during the day and night. Sunrise in the mountains enlighten us much emotion accompanied by small streams that go to the depth of the Sacred Valley. The road getting better preserved is because of the restoration and recovery of archaeological remains by government authorities. 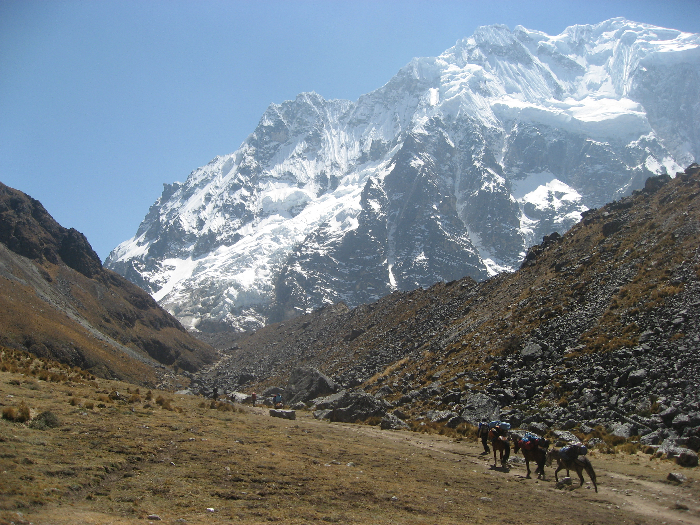 Huayllbamba (3000m), is the place where we encounter the classic Inca Trail and our camping. 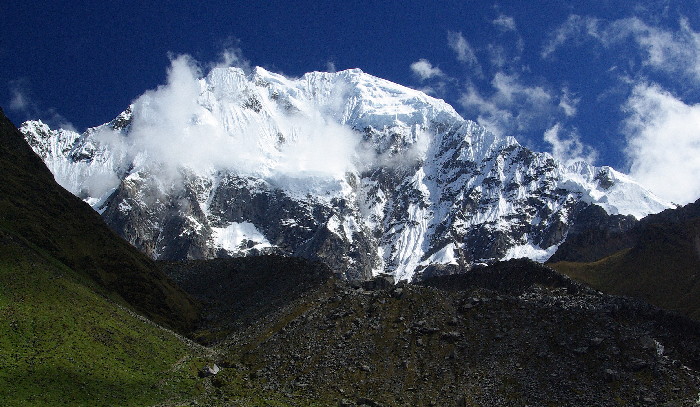 Early we take the path of ascent in tropical forests to the summit of the pass called Warmiwañusca (4200m). Throughout the day our walking pace will be slow and always with the accompaniment of a professional guide. After a brief moment at the summit we continue descending to the campsite called Pacaymayu (3500m) path. Hiking time: 7 hours. Cold weather. During the morning we went through the Runkurakay pass (3900m), where we observe the vegetation change constantly up to pass through tropical forests High Forest. This is a wonderful day for the visit of great archaeological groups that are on the road as Runkuraqay (3800m), Sayacmarca (3600m), Phuyupatamarca (3580m) and finally Wiñayhuayna (2650m), place of our camp. Hiking time: 7 hours. moderate and warm with mosquitoes cold weather. Early we look at the phenomenal attraction of the sunrise, in place of “Inti Punku” (2730m). 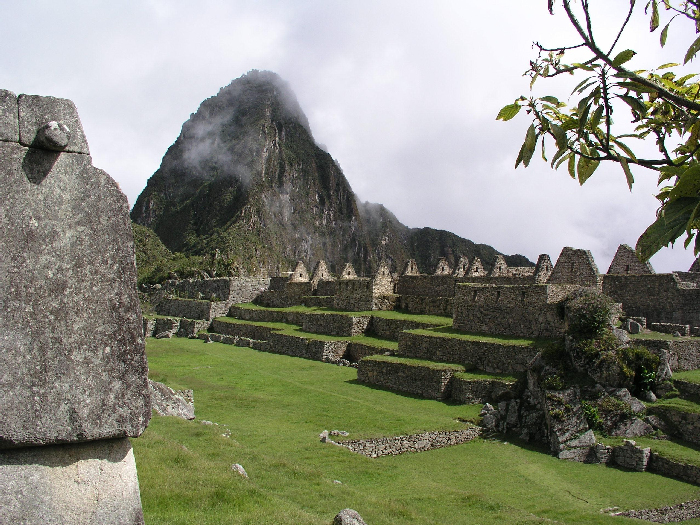 This is an unforgettable experience and conducive to take the view of Machu Picchu, “the Lost City of the Incas”. Aguas Calientes (2050m), is the place where we reconvene before taking the tourist train to Cusco. Hiking time 3 hours. warm climate with mosquitoes. It includes breakfast. Tent with table and chairs, bathroom tent). Meals during the excursion (Breakfast, Lunch, Dinner / Snack and snacks / Option vegetarian). Horseman and mules, for all our camping equipment and personal equipment customer. Train from Aguas Calientes to Cusco / Aguas Calientes to Ollantaytambo and bus to Cusco. Basic Overnight at Aguas Calientes town. First aid kit, oxygen and strings. Backpack suitable for 5 days walking & rain cover. Clothing: For the first two days warm clothing is suggested, since walking is close to the 4650 m.s.n.s.m. almost beside the snow. long pants, long-sleeved shirts, sweaters and a jacket hat and gloves. Clothing: For the last three days light clothing is suggested, as the walk includes jungle. Hat, shorts, polo or light, insect repellent and sunscreen shirts. Swimsuit (if you go to the thermal baths). Grooming kit: small towel, toilet paper, etc. Waterproof and / or umbrella. Camera and / or camcorder. Original passport Students must take effect ISIC card. Medicine and / or personal items (couple of bandages, muscle pain cream, pills altitude sickness, fever, upset stomach). Walking stick with rubber tips (optional). Copyright © 2019 Machu Picchu Wayna. All rights reserved.